For many people, rabbits make the perfect pet -- rabbit owners often describe their companion animals as intelligent, affectionate and playful. The word's out about rabbits, too, with the USDA's Animal and Health Inspection Services estimating that as many as 5 million pet rabbits reside in American households. While mention of a rabbit tends to bring to mind specific images for most people, there are in reality more than four dozen breeds of floppy-eared friends, with weights ranging from several ounces to over 20 pounds. Washington State is native soil for the world's smallest rabbit, a pygmy breed known as the Columbia Basin pygmy rabbit that weighs less than a pound at full adulthood. Listed as endangered in 1990, the rabbit was considered almost extinct in 2001, but recent recovery efforts spearheaded by the Oregon Zoo have been successful and the breed is expected to survive. Dwarf rabbits are small due to a dwarfing gene that makes them tiny and extra-cute -- the latter probably accounting for their overwhelming popularity. The rule for dwarves is a maximum weight of 4 pounds. The 2-pound Netherland dwarf is the most common pet dwarf, though new breeds such as lionhead and Jersey wooly are steadily gaining favor among American pet owners. 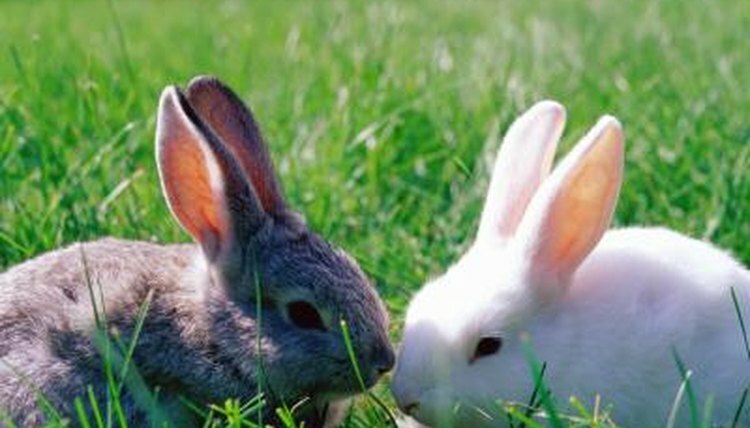 Medium rabbit breeds range in size from 6 to 10 pounds. There are a number of medium-sized breeds, including satin and rex, with the most popular being the Dutch -- with its distinctive black-and-white markings, the Dutch is an icon of domesticated rabbits. Dutch rabbits are the prototypical Easter bunny, with people impulse-buying them in early spring -- an unfortunate trend that often results in poorly cared-for bunnies. As of this writing, the title holder for world's largest rabbit is Ralph, a 55-pound continental giant from the United Kingdom reported to eat $90 worth of food each week. Giant rabbit breeds also include giant angora, Flemish giant, checkered giant and giant chinchilla, the latter of which is a cross between a regular chinchilla and Flemish giant. Originally bred to meet demands for meat and fur, giant rabbits are now most popular as pets.